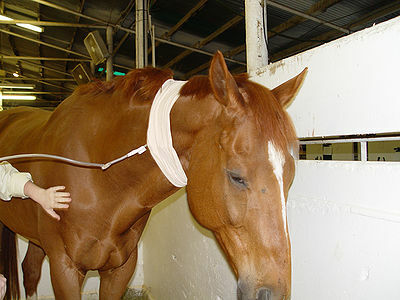 Changes in routine can be particularly stressful to horses. They don’t fully understand what’s happening and being away from familiar places can be upsetting. 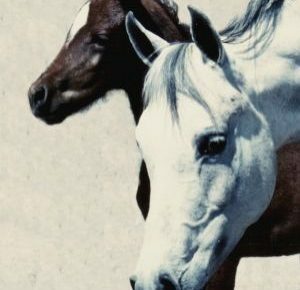 The stress can take its toll on your horse’s gastrointestinal tract and increase the risk of colic and ulcers. You can lower the risk of problems by following a simple regimen when traveling. If you plan to make any changes in feed, recommendations are to begin gradually, over a period of a week or two before going on the road. Take enough feed on the trip that you normally give your horse, calculating the amount for each day away. Then add a bit more just in case. Take enough extra hay along – the more forage your horse chews will buffer stomach acid. 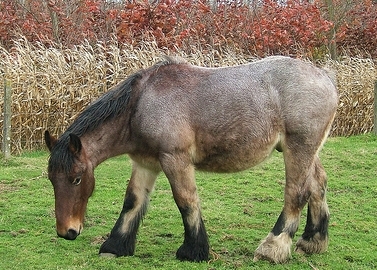 Consider purchasing a haynet for horses used to grazing. Humidity can produce mold in feed, so it’s best to leave grain in its original bag. If you can’t take along your horse’s feed or run out of it on the road, try to replace with substitutes whose ingredients are as close as possible to the home feed, including the type of hay. Compare ingredients and values to make sure they are the same or similar to your horse’s regular feed. For horses fed commercial feed and are often traveling, the recommendation is to feed them at home with a nationally available brand. That way there will be no change in feed. Make sure your horse receives an adequate amount of salt so that s/he will drink enough water to avoid dehydration. There is a trick to teach your horse to drink different water. At home, add a few drops of apple cider vinegar to your horse’s water, but always have a bucket of plain water available too. Consider adding pre- and probiotics to your horse’s diet that will coat the stomach and add protection. Consult with your vet about other supplements. Having a plan and preparing before you take your horse on the road will make the trip more pleasant for both of you.